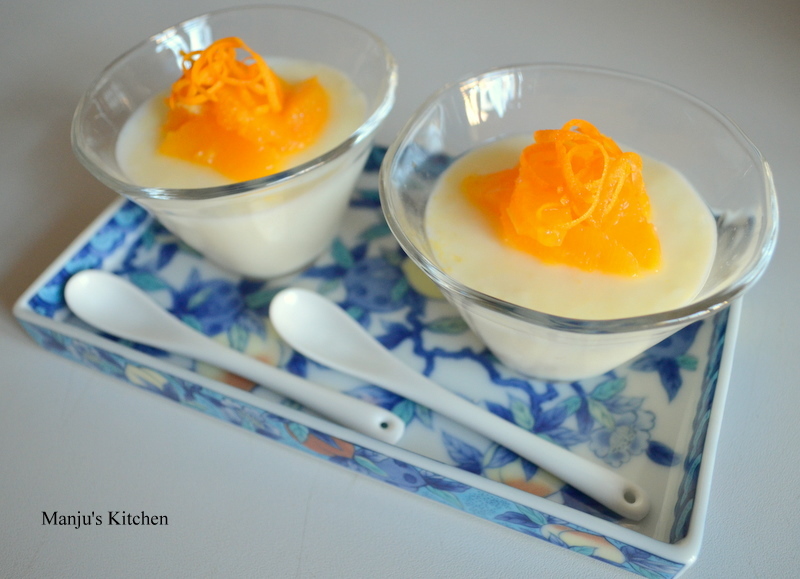 This is a simple vegetarian dessert set with Agar-agar instead of gelatine. Agar-agar is called Kanten in Japanese, and growing up, my mom always called it China grass. She always made desserts for our vegetarian guests using this. The name agar-agar is of Malay-Indonesian origin which means jelly. Agar-agar is a natural vegetarian substitute for gelatine; extracted from a marine red algae. It is a very popular dessert ingredient throughout Asia, but these days it used as a common ingredient in molecular gastronomy to make all sorts of jellified shapes like spaghetti and pearls with various ingredients. 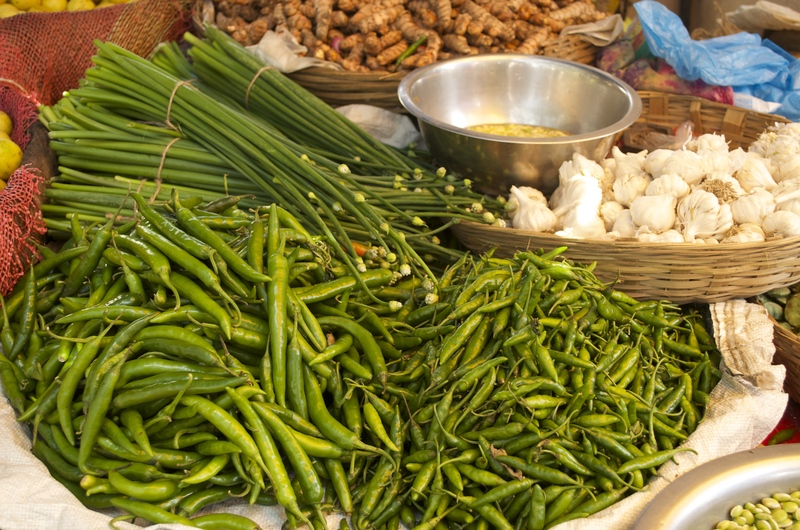 It is an ingredient completely odourless and tasteless so you can incorporate it into all sorts of dishes. 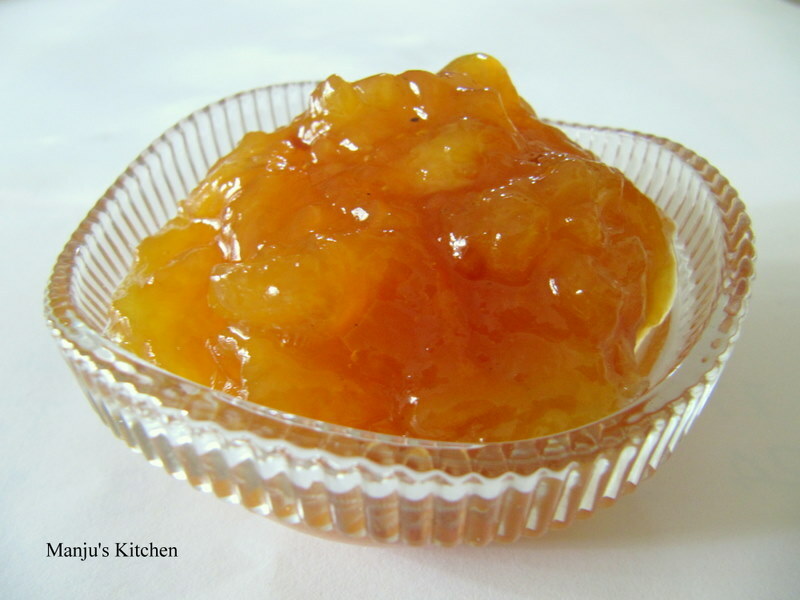 Because of its high jellifying properties it is considered as the queen of gelling agents. 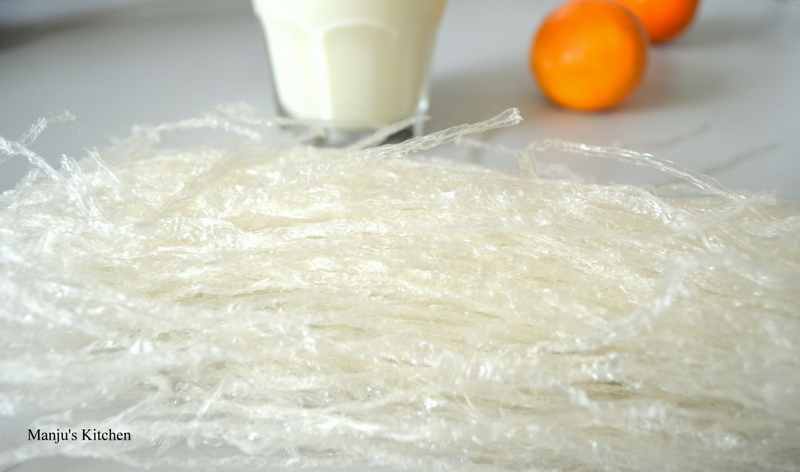 It gels below 40° C and retains its firmness even at high temperatures of up to 80°C, unlike animal based gelatine which melts at 37° C.
You can find it in most Asian grocery stores, sold in packages as dried white strips (as in the picture above) or as a white powder. 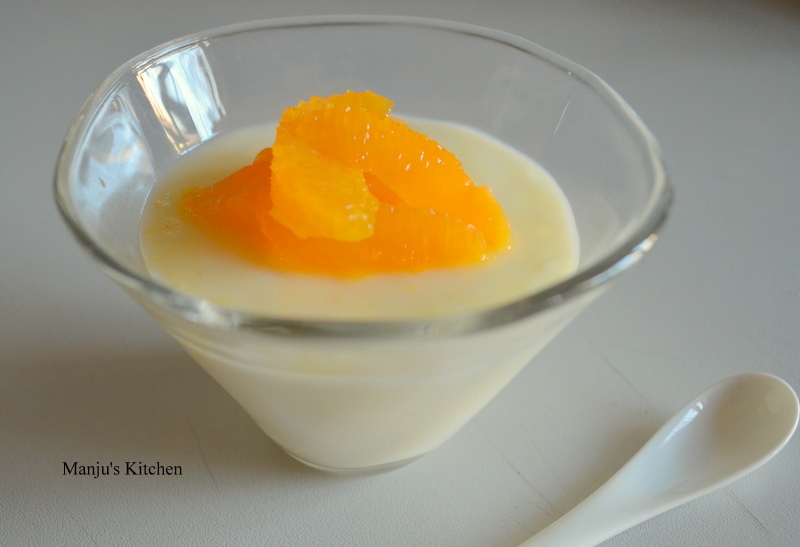 I have used dry agar-agar strips in this recipe (soaked in water and then boiled with milk), but if agar-agar powder is available, I suggest using that instead because it dissolves much more easily and you don’t have the hassle of soaking it beforehand and boiling it for a long time. Adjust the amount of sugar according to your palate. Condensed milk is added to give a more milky flavour to the finished dish. When the jelly is set, serve it with any fruit topping. I have used orange segments but strawberries work well as well – use fruits which are in season. Soak Agar-agar in the water for 10-15 minutes and then boil together with milk for 10-15 minutes until it melts and dissolves. Add sugar and condensed milk and bring to the boil again, remove from the heat and cool slightly. Pass it through a sieve and pour into prepared moulds and chill in the fridge until set. Serve with a fruit topping of your choice.